In 1996, Rhett Akins released his highest charting album. The first single from that set went all the way to #1 on the country singles charts, but after that it seemed to be a slow decrease in the singing side of Rhett’s career. Somebody New is still a great country album. Why it didn’t get more notice on the charts or from fans is kind of a mystery to me. I love going back and listening to it and one of the songs that wasn’t released as a single is probably my favorite. Somebody New is a simple song. It’s about a guy admitting he was wrong to his woman. What I love most about the song though is the melody. When Rhett hits the chorus he pours his heart out lyrics. You can believe what he’s singing. All guys have known they’re wrong more than their fair share, but it seems we always have difficulty finding the right way to apologize. It’s just not in our wiring. Rhett Akins seems content today letting other artists record his songs. His son has even gotten into the songwriting game and has had a cut on the latest Jason Aldean record. I’m sure Rhett will continue releasing his own music. He’s been doing it nonstop even since he left the major label game. Perhaps there will be a hit from him in the future too. And maybe we’ll even hear his son on the radio at some point. 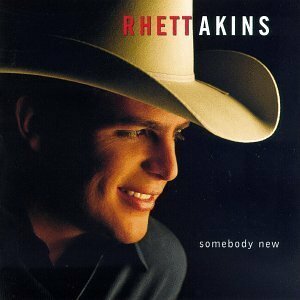 Until then I like to flashback to the songs Rhett released back in the ’90s and my favorite is Somebody New .